Welcome to the Kingdom for an Independent Oahu! "Hoi Hou o ka Alii Aimoku" - "Return of the Alii Aimoku"
Painting by Herb Kawainui Kane ©, KS (MLC) collection. Welcome all to the official Kingdom for an Independent Oahu website. We are a grass roots group who believe that the Kingdom of Oahu was wrongfully annexed in 1783 by Maui and, in turn, brutally annexed by the power hungry King Kamehameha I of Hawaii. It is the goal of the Kingdom for an Independent Oahu to right these age-old acts of unjust terrorism. I am the direct descendant of the great Kahahana, the 24th Alii Aimoku of Oahu. We are continuing our quest to reclaim the throne as spread the word that I am the rightful heir to the throne of the Kingdom of Oahu. Only my family knows of the whereabouts of the ancestral remains of the Alii Aimoku of Oahu, located somewhere on sacred ground on the island of Oahu. This carefully guarded secret is the key to our legacy. I invite you to join us in our endeavor while welcoming all into this long overdue reinstation with open arms. Born in Kohala on the island of Hawaii as an only child, Patricia Aupoliana grew up on a farm, learning the ways of the land. Throughout her high school years, she learned about how her family was originally from Oahu and the true story of the wrongful conquer of Oahu by the Maui forces in 1738 and subsequent unjust takeover by the tyrannical Kamehameha I at Nuuanu in 1795. She learned that her father was a direct descendant of Kahahana, the 24th Alii Aimoku of Oahu. Although her father felt strongly about how Kamehameha I's deeds were nothing more than an act of terrorism, he felt powerless to do anything about it. This fueled our future Queen's drive to seek out others who felt the same way. Patricia got married, briefly, and had one son, Patrick. She worked for many years as a clerk for a local department store. When her parents passed away, it meant that Patricia had become the senior most descendent of the Alii Aimoku of Oahu. After gathering up some supportive confidants, Patricia set-out to spread awareness throughout the community. 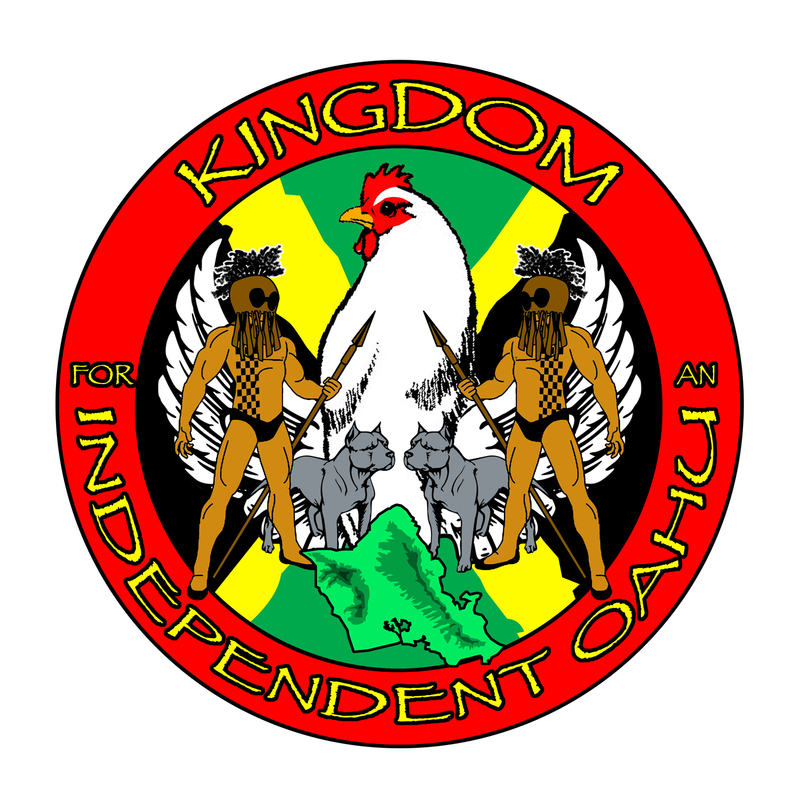 In 2004, after much planning and preparation, the Kingdom for an Independent Oahu was established. In April of that year, a grand coronation ceremony was held deep in Kalihi Valley heralding Patricia as the Queen and 25th Alii Aimoku of Oahu. Today, our Queen continues to spread awareness to the people that the island of Oahu and abroad that she is, indeed, the rightful monarch of Oahu. Her on-going next step is to receive a formal apology from the direct descendants of Kahekili II and Kamehameha I, and admission that Kamehameha I's acts were cruel and unjust. Welcome. 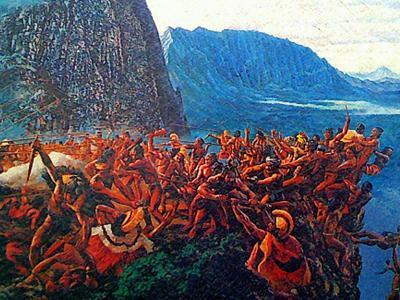 We are a group of Oahu natives who believe that the Maui conquer of Oahu in 1738 and the Battle of Nuuanu in 1795 were unjust acts of terrorism orchestrated by Kahekili II and, later, Kamehameha I. We denounce the age old propaganda that King Kamehameha I “united the Hawaiian Islands” when he and his forces actually took them by force. Some of the horrific acts that are not publicized include the slaughter of many women and children. Along with our Queen, Her Highness Patricia Aupoliana-Rodie, 25th Alii Aimoku of Oahu, we seek a formal apology from the direct descendants of Kahekili II and Kamehameha I, and admission that their acts were cruel and unjust. Established in 2004, the Kingdom for an Independent Oahu began educating people by word-of-mouth and with fliers. Now, with the help of a web coordinator, we can communicate our thoughts over the internet. Join us! We are NOT looking for and are NOT accepting donations. We just ask that you help us spread the word. "Like" us on Facebook, voluntarily print up your own shirts and bumper stickers using our official seal. Do what you can. Remember, if you create a product, email it to us so that our Queen can approve it first. Become a citizen of the Kingdom for an Independent Oahu today! My name is Johnny Freitas Jr. and I am honored to be selected by our Queen as the Public Relations Officer to the Kingdom for an Independent Oahu. I will be working together with Smitty McFarland on pushing to make our website better for all of you with more information when we get it. Thank you to all of you for your support. Please visit us on Facebook and like us and send us your comments. Tell your family and friends about us. Do anything you can to get the word out! I was making my rounds around Kapiolani Park in 2007 when the queen was saying hi to the pepole who never knew her yet. Even though the pepole didn't know who she was, there eyes were glued to her like glue. Our queen is a real nice lady who has much aloha for all the commoners. I am very proud to serve my queen any way she likes. Sometimes she asks us to drive her around the island so she can see the pepole doing there things they do. She's really intrested in all of you and wants to be your queen in the new soveren Oahu. Welcome everybody to the Kingdom! We have received an open letter from a Dr. Adonis Thirsk regarding the Kingdom of Oahu. We have posted it here, along with the Queen's direct response, in an effort to set the record straight. It has come to my attention that if the Kingdom for an Independent O'ahu does get their wish to have complete ownership of the island of O'ahu, there are plans to relocate both settlers and natives if they do not have ancestral blood tying to that of the Ali'i Aimoku of O'ahu. Is this true? If so, then you are gravely misguided. How can you call yourselves a "Hawaiian sovereignty" group when you are blatantly planing on excluding native Hawaiians? Furthermore, King Kamehameha the Great did, indeed unite the Hawaiian islands and made it stronger. Without him, the individual islands would be lawless. Please rethink your ways and focus your energies on joining up with, and giving your loyalties, to a true sovereignty group that's trying to make Hawai'i a better place to live in by weeding out the unworthy, non-Hawaiians. First of all, thank you for your letter. Secondly, it is apparently you who is "misguided" or, more appropriately, misinformed. We, the Kingdom for an Independent Oahu, have never made any claims to plan on relocating "settlers and natives". On the contrary. We welcome everyone who wishes to become a citizen of Oahu. Thirdly, we have never referred to ourselves as a "Hawaiian sovereignty group" and never will. The closest term, if we had to fabricate one, would be "Oahu sovereignty group". If you took the time to read more about us, you would learn that we're protesting the unlawful and unjust takeover of our island by both Kahekili II and, later, Kamehameha I. We are just trying to right an age old wrong. We invite you to join us and become an official citizen of the Kingdom for an Independent Oahu. We are NOT looking for and are NOT accepting donations. We just ask that you help us spread the word. "Like" us on Facebook, voluntarily print up your own shirts and bumper stickers using our official seal. Please include the words "I AM A WAHINE CITIZEN" (if you are a female, or "I AM A KANE CITIZEN" (if you are a male). Do what you can. Remember, if you create a product, email it to us so that our Queen can approve it first. If it's good, she may wish to thank you and give you credit for your hard work. WARNING! THE KINGDOM FOR AN INDEPENDENT OAHU SEAL IS NOT TO BE USED FOR PROFIT PURPOSES WITHOUT THE EXPRESS WRITTEN CONSENT OF THE QUEEN! COMMONERS ARE ALLOWED TO USE THE SEAL ONLY IN A NOT-FOR-PROFIT MEANS TO HELP CREATE AWARENESS ABOUT THE KINGDOM! Become a citizen of the Kingdom for an Independent Oahu today! IMPORTANT NOTE: The use of Herb Kane's amazing artwork in no way implies that he supports our cause.